BEIJING. Sen. Manny Pacquiao and Ever Bilena CEO Dioceldo Sy, who owns the Blackwater franchise in the PBA, go back a long way. They were introduced to each other in 1997 and developed a special friendship but hadn’t reconnected for 15 years until in 2013, the long-lost buddies crossed paths during the FIBA Asia Cup semifinal game between the Philippines and South Korea at the MOA Arena. Today, Pacquiao and Sy are close together again. They recently shook hands to form a partnership that will take the lead in promoting professional boxing in China and other parts of Asia. 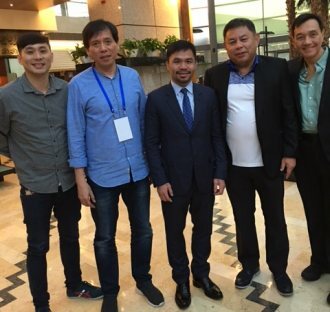 Pacquiao was approached by the Chinese government to assist in pushing the sport in the Mainland and thought of joining forces with Sy in the effort. Last Friday, Pacquiao’s first co-promotion with Dancing Sports through the Professional Boxing Commission of China got off to an auspicious start at the Heyuan Royal Garden Hotel grounds here. The card featured nine bouts in the first leg of the Belt and Road World Boxing Champion Tour. The plan is to produce four or five boxing shows a year in the Mainland. Sy flew in to witness the proceedings. As their relationship grew closer, Sy offered to buy out Pacquiao’s contract for P1 Million in 1998. Pacquiao had advances of P800,000 with his manager and Sy said he would settle the debt. The deal, however, never pushed through. Sy received a threatening phone call from an unidentified person to stay away from Pacquiao. “My father told me to back off since I didn’t really know the people involved in boxing,” he said. “We had our business to attend to and we didn’t need the distraction.” So Sy and Pacquiao went their separate ways. Sy became an even more successful businessman with Ever Bilena while Pacquiao blossomed into a people’s champion in sports and politics. During his brief visit here, Sy kept his eyes open, particularly in observing how to relate with Chinese government, business and sports officials. Sy made his first trip to the Mainland to do business in Shanghai in 1994 and often visits Chinese cosmetics suppliers in different cities to cement relations. His track record of success in business is what he brings to the table in partnering with Pacquiao in this latest venture to promote boxing in China. 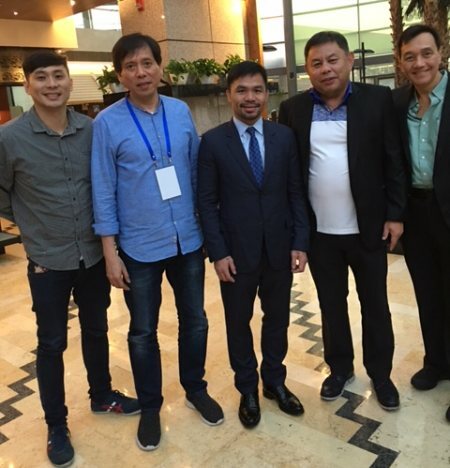 Sen. Manny Pacquiao with (from left) PBCom Caloocan branch manager Sherwin Ng, Philboxing contributor and translator Peter Tsai, Ever Bilena CEO Dioceldo Sy and writer "The Dean" Joaquin (Quinito) Henson in Beijing.